Glutoxim® has an immunomodulatory, hemostimulating, detoxifying, hepatoprotective effect, inhibits the drug resistance of tumor cells to anthracycline antibiotics, alkylating agents; allows to overcome the drug resistance of Mycobacterium tuberculosis to isoniazid, associated with the katG genes (catalase-peroxidase gene) and inhA (enol-APB-reductase gene). Glutoxim® Potentiates the effect of doxorubicin on tumor cells, chemotherapy (isoniazid, rifampicin, rifabutin, cycloserine, capreomycin, levofloxacin, cationic antimicrobial peptide catalecidin) on Mycobacterium tuberculosis. interleukin 2; cationic antimicrobial defensin peptides, catalecidins. Hemostimulating action of the drug Glutoxim® caused by receptor-mediated enhancement of bone marrow hematopoiesis: the processes of erythropoiesis, lymphopoiesis and granulocyto-monocytopoiesis. The effect on progenitor cells of different lines of blood cells is mediated by the functioning of the MAP and inositol kinase systems, leads to an increase in the resistance of differentiating hematopoietic cells, and restores their sensitivity to the action of endogenous factors of hemopoiesis. Detoxicant and hepatoprotective effects of the drug caused by receptor-mediated enhancement of expression of enzymes second phase detoxification of xenobiotics, including glutathione, glutathione peroxidase, glutathione-S-transferase, glucose-6-phosphate dehydrogenase, heme oxygenase-1, increase the intracellular level of glutathione, providing protection of cellular structures against the toxic action radicals. Glutoxim® It has a direct inhibitory effect on the activity of the multidrug resistance factor of tumor cells - protein P-glycoprotein (Pgp), which determines the resistance of tumor cells to the action of chemotherapy, including anthracycline antibiotics, drugs of alkylating action. Glutoxim® initiates the transformation reaction of isoniazid - a prodrug, in the pharmacologically active form - isonicotinic acid, which have a bacteriostatic effect on Mycobacterium tuberculosis, which allows to overcome the drug resistance of Mycobacterium tuberculosis, due to the negative transformation of the katG genes (catalase-peroxidase gene) and inh ). Glutoxim® It stimulates the exocytosis of vesicle macrophages intracellularly parasitic microorganisms, including Mycobacterium tuberculosis, enabling their removal from the pharmacological seekers and making accessible to the action of antibacterial drugs including isoniazid, rifampicin, rifabutin, cycloserine, capreomycin, levofloxacin. Glutoxim® enhances the secretion of cationic peptides - defensins and catalecidins by macrophages, stimulates their uptake by mycobacteria of tuberculosis, determining the mediated antibacterial effect of the drug. Glutoxim® contributes to the effective restoration of bone marrow hematopoiesis during antitumor therapy. Glutoxim® eliminates or smoothes the manifestations of nonspecific disease syndrome (anemia, fatigue, loss of appetite, increased pain sensitivity). Adults take the drug in / in / m and s / c in a dose of 5-40 mg daily, depending on the severity of the disease. Course dose - 50-300 mg.
With the preventive purpose of the drug is used in / m at a dose of 5-10 mg daily for 2 weeks. In case of tuberculosis (as part of complex therapy), the drug is prescribed i / m 60 mg 1 time / day every day for the first 10 days, for the next 20 days Glutoxim® impose a / m at a dose of 60 mg every other day. If necessary, conduct a second course of treatment after 1-6 months. In the complex therapy of uncomplicated forms of psoriasis Glutoxim®used in / m daily in a daily dose of 10 mg for 15 days, then for another 5 weeks, 2 times a week in a daily dose of 10 mg. Only 25 injections per course of treatment. As a means of accompanying chemotherapy in oncology, Glutoxim® Injected s / c in a dose of 60 mg for 1.5-2 hours before the use of anticancer drugs. Further between courses of chemotherapy, the drug is injected s / c at a dose of 60 mg every other day. With the next course of chemotherapy, the drug is repeated. As a means of tracking radiation therapy Glutoxim® A sc can be administered at a dose of 60 mg 0.5–1 h after the next irradiation session every other day during the entire course of radiation therapy. Glutoxim® can be administered in the same syringe with water-soluble drugs. It is possible: in some cases - an increase in body temperature (37.1-37.5 ° C), pain at the injection site (to reduce pain, it is possible to administer the drug simultaneously with 1-2 ml of 0.5% novocaine solution). 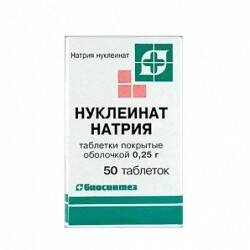 Glutoxim® with combined use, it potentiates the bacteriostatic effect of isoniazid, rifampicin, rifabutin, cycloserine, capreomycin, levofloxacin on Mycobacterium tuberculosis, the anthracycline antibiotic doxorubicin, the alkylating agent etoposide on tumor cells. Glutoxim® reduces the therapeutic effect of nifedipine and verapamil. Inhibitors of the arachidonic acid cyclooxygenase oxidation pathway - indomethacin, meloxicam - reduce or completely suppress the pharmacological effect of the drug Glutoxim®. An isotonic solution of sodium chloride or 5% glucose solution is used as a carrier solution for infusion. 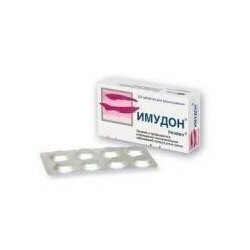 Clinical studies of the drug Glutoxim® during pregnancy and lactation (breastfeeding) were not carried out. 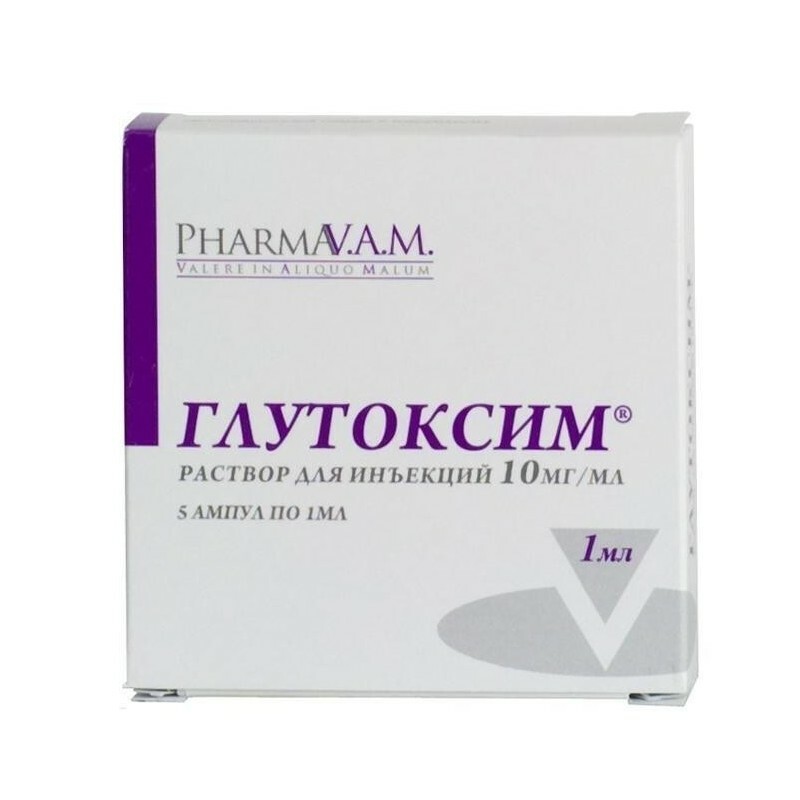 Glutoxim® - Russian innovative drug, a representative of a new class of drugs - regulators of the body's protective systems (innate defense regulators, IDR). The drugs of this group, according to their pharmacological activity, belong to antibiotic adjuvants: the main effect of Glutoxim is potentiation of anti-tuberculosis chemotherapy, including increasing the availability of mycobacterium tuberculosis to the action of drugs and overcoming the drug resistance of the pathogen. According to the results of basic and clinical research, Glutoxim®enhances macrophage secretion of endogenous antibiotics - cationic antimicrobial peptides (CAP) (defensins and catalecidins), stimulates their uptake by mycobacteria. The action of CAP leads mainly to the disruption of the structure and functions of the cytoplasmic membrane of the pathogen, which, in turn, leads to the death of the latter. Antibacterial activity of the drug Glutoxim® manifested in its introduction in vivo, requires for its implementation the presence of a mobilization-capable pool of endogenous CAP, i.e. in relation to the action of the preparation CAP, act as effector molecules, predetermining its indirect antibacterial effect. The effect of the drug is complemented by the effect of overcoming the drug resistance of Mycobacterium tuberculosis to isoniazid. Glutoxim® initiates the transformation reaction of isoniazid (prodrug) into the pharmacologically active form, isonicotinic acid, which has an antimycobacterial effect against the pathogen, which allows to overcome the drug resistance of Mycobacterium tuberculosis due to the negative transformation of the katG genes (catalase-peroxidase gene) and inhA (the gene-isoxolase) and the is-lol gene; ). The action of the drug is accompanied by an increase in the production of peroxynitrite and nitosoglutathione - compounds with independent bactericidal action. It is also shown that Glutoxim® limits the possibilities of intracellular parasitization of mycobacterium tuberculosis. The drug stimulates exocytosis (elimination) of vesicles with intracellularly parasitic mycobacteria from macrophages, ensuring their removal from the pharmacological shelter and making them available for the action of antibacterial drugs, including isoniazid, rifampicin, rifabutin, cycloserine, capreomycin, levofloxacin. The pharmacological effect of Glutoxim in relation to the antibacterial activity of the listed antibiotics is potentiating, since it increases the availability of the target (microorganisms) to the action of the drug. Glutoxim® improves tolerability of anti-tuberculosis chemotherapy: toxic reactions (increased ALT, ACT, bilirubin, serum creatinine levels) were observed only in 4.3% of patients, while in the control group - in 11.1% of patients (р® were noted much less frequently - in 6.4 % of patients, with 20% in the control group (p®, were stopped mainly in the first 2 months of treatment. Glutoxim® prevents the exacerbation of chronic hepatitis during chemotherapy for tuberculosis, and with already developed medical lesion of the liver - allows you to continue chemotherapy in full, without resorting to its temporary cancellation. Glutoxim® more than 4 times reduces the incidence of toxic hepatitis. Glutoxim® helps to prevent or reduce the severity of skin reactions (dermatitis) and mucous membranes (mucositis, stomatitis, rectitis, cervicitis) to radiation and exposure to chemotherapy. Complications in the form of early radiation rectitis in patients with stage III cervical cancer with the use of the drug Glutoxim® develop less frequently (6.15% vs 16.0%), restoration of pelvic organs functions occurs faster (р® in patients with oropharyngeal tumors contributes to a significant decrease in the severity of subjective manifestations of radioepitheliitis - the frequency of bleeding gums and the appearance of focal epithelium is significantly reduced. The frequency of such complaints as dry mouth, pain when swallowing, change in taste. Glutoxim® contributes to the improvement or preservation of the quality of life of patients receiving chemotherapy and therapy, provides the opportunity to conduct all required chemotherapy courses. 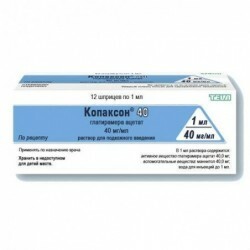 In patients with stage III-IV oropharyngeal tumors treated with radiation therapy, Glutoxim® contributes to the restoration of quality of life - the Karnofsky index increases to 90% (at 50-60% in control) (p® contributes to full chemo, radiotherapy and chemoradiation therapy, without reducing the planned courses. Clinical studies have shown an increase in the frequency of positive responses to a radical course of radiation therapy for locally advanced cervical cancer. The rate of achieving complete remission was 77% (in the control group, 38%). There was a faster recovery of peripheral blood counts and improvement of the general condition of patients on the background of radiation therapy. Glutoxim® contributes to an increase in the frequency of complete (including morphological) remission and disease-free survival. The frequency of positive responses to radiation therapy in patients with stage III-IV oropharyngeal cancer (complete + partial remission) in the group of patients who received Glutoxim®, was significantly higher than in the control group - 83.4% and 61.5%, respectively. In patients with HER-2 (-) stage II-III breast cancer, joining Glutoxim to neoadjuvant therapy® led to a doubling of the previously achieved frequency of complete morphological remission. In chemotherapy of patients resistant to platinum ovarian cancer with the inclusion of the drug Glutoxim® The median of relapse-free survival was 15.4 weeks, while without the use of the drug, according to historical control, this indicator was 8 weeks in patients with the same intensity treatment. The average period of relapse-free survival was 19.4 weeks. The inclusion of the drug Glutoxim® In the scheme of chemotherapy showed clinical feasibility (complete remission + partial remission + stabilization) in 60% of patients. When prescribing the drug Glutoxim® According to the results of clinical studies, patients with psoriasis experienced a faster (5-6 day of therapy) and a full regress of eruptions (infiltration, peeling, puffiness), itching decreased and quality of life improved: the PASI index decreased from 39.5 ± 4.0 to 11.7 ± 5.2, while in patients who received standard therapy - from 26.1 ± 2.6 only to 21.0 ± 2.9 (p® showed hepatoprotective and toxic-modifying effect: after 7-10 days of therapy, symptoms of the liver decreased, pain decreased or stopped and / or severity in the right hypochondrium, transaminase ALT normalized from 65.9 ± 34.5 U / l to 45.9 ± 15.0, AST from 98.1 ± 25.4 U / l to 45.5 ± 13.4 U / l (p® period of remission was 6 months - in 19% of patients, within a year - in 20.8% of patients, more than 1 year - in 51.2% of patients, 1.5 years and more - in 9% of patients. 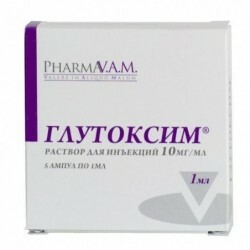 In the complex therapy of sexually transmitted infections, Glutoxim®, as an antibiotic adjuvant, increases the effectiveness (potentiation) of etiotropic antibiotic therapy of urogenital infections (IGO), one of the factors for the formation of profound reproductive disorders (up to infertility), reduces the risk of subsequent relapses of IGOs. 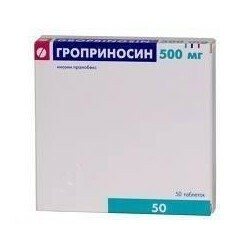 According to the results of clinical studies, the effectiveness of UGO therapy 1 month after the end of treatment according to the results of PCR (elimination of the pathogen) in the group of patients who received only antibacterial therapy was 64.5-73.6%, and in the group that received Glutoxim along with antibiotic therapy® - 97.4% -98.7%. With the inclusion of the drug Glutoxim in the scheme® recurrences of the infection were also less likely to be detected, and there was a decrease in the likelihood of recurring development of the IGO (with repeated infection or reinfection) during the 12 months of follow-up after the treatment. Glutoxim® helps to increase the effectiveness of complex therapy of chronic inflammatory diseases of the internal genital organs of women. 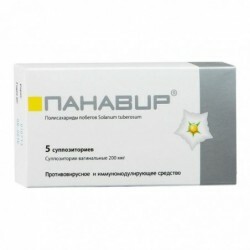 The inclusion of the drug Glutoxim® in the treatment of chronic inflammatory process of the internal genital organs in women of reproductive age increases the effectiveness of treatment. The restoration of the immune system function is noted, incl. at the local level: activation and normalization of indicators of non-specific protection occurs - for example, the concentration of secretory IgA and IgA cervical mucus. Manifestations of the inflammatory reaction are stopped (rapid regression of the pain syndrome during the first 7 days), improvement in the quality of life of patients and persistent clinical recovery in 96.8% of patients is noted. Glutoxim® helps to increase the effectiveness of complex therapy of chronic inflammatory diseases of the male genital organs, incl. complicated excretory toxic sterility. As a result of studies of the effectiveness of the inclusion of the drug Glutoxim® In treatment regimens, a pronounced anti-inflammatory effect was revealed: with light microscopy of the prostate gland secretion before treatment, leukocytes of 91.3 ± 11.2 in the field of view, after treatment - a decrease to 11.9 ± 1.8 (р® in the treatment regimen of chronic bacterial prostatitis (CKD) reduces the treatment time to 3 weeks (versus standard 4-6 weeks). In the treatment of CKD in combination with IGO, the inclusion of Glutoxim® allows you to increase the time of remission and reduce the recurrence rate by 3 times. The inclusion of the drug Glutoxim® In the treatment of CKD, it improves the erectile and ejaculatory component of the male copulatory cycle. Currently, cases of drug overdose Glutoxim® not reported. Dosage form: Injection colorless or slightly colored, transparent, odorless or with a faint odor of acetic acid.